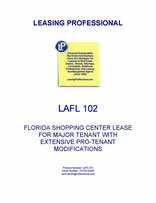 This form is for a single tenant Florida lease where the tenant has superior leverage. It gives the tenant the right to use the premises for "any legal use," and has very abbreviated remedies for the landlord in the event of a tenant default. It is also pro-tenant in character because of the clauses it does not contain which customarily appear in pro-landlord forms relating to remedies and a variety of other pro-landlord provisions. 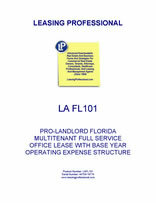 This form is for a Florida office lease for a full service multitenant building. The tenant is responsible for payment of base rent plus payment of the tenant's pro-rata share of operating expenses in excess of those for the specified base year. Despite the comprehensive definition of operating expenses under the lease, no fewer than 28 pro-tenant exclusions to operating costs are also contained in the lease, making for a balanced approach to the tenant's operating expense obligations. This percentage rent form is for a Florida shopping center tenant with considerable leverage, and the lease has pro-tenant modifications sprinkled throughout. There are percentage limitations on various expense items, for example, the tenant's share of common area maintenance costs has a fixed dollar limitation for year one of the lease, and the tenant's share cannot increase more than five percent per year thereafter (compared to the preceding year). The tenant has a termination right if its sales do not exceed a certain amount in specified years, but must pay the landlord a termination payment if the tenant exercises that right. As the southeastern most state of the union, Florida experiences tropical temperatures year round, but has been hit by destructive hurricanes in recent years. The American home of alligators and the Everglades, Florida is tourism hub, boasting the world’s busiest cruise port at Miami and the United State’s highest average temperatures. Florida is a premier producer of oranges, grapefruit and tomatoes.